Attractive, functional and very durable, this 4-post drafting table is constructed of the finest quality solid oak. Careful selection of materials and through-bolt construction ensure that this drafting table will stand up to years of rough use. The solid oak base is finished with 2 coats of clear varnish for added protection. The top is crafted of 3/4" warp-free white Melamine. A one-handed tilt mechanism enables you to quickly adjust the top angle from 0 to 45 degrees. Easy drafting table assembly using the included instructions. 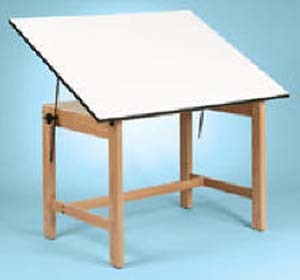 * 37" drafting height table is ideal for most drafting environments. For conveniently stowing tools and supplies, 37-inch height tables includes a 23"d x 31"w x 1-1/2"h drawer with dust cover. * 30" office height drafting table is a great option for environments where one must routinely alternate between a standard computer workstation and a drafting table. This drafting table accommodates standard office chairs and offers plenty of leg room.